Our fantastic crew will gladly accompany you in the most picturesque dive spots of the island, from Ponta de Sao Lourenço, Garajau and to the spectacular Ilhas Desertas (Deserted Islands), protected area since 2000 and beloved territory of rare monk seal! A few steps from the shop, a solid concrete jetty stretches out into the bay, sheltered from the wind. Equipped with stairs, handrails and a practical platform at the sea surface level, our jetty offers an easy entry and exit point for divers and swimmers. 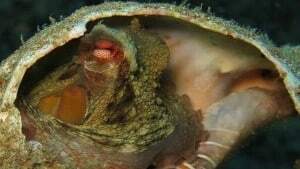 It is an easy and lovely dive spot, where the alternance between rocky and sandy bottoms allows to spot different species of marine organisms, such as octopi and cuttlefish, barracudas, stingrays and eagle rays, moray eels and much more. Occasional encounters with monk seals are getting more and more frequent. This zone is well-known for its great biodiversity and visibility, up to 50 mt. Regular encounters with octopi, cuttlefish, stingrays and huge schools of fish. 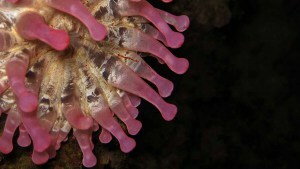 For experienced divers, stunning vertical walls up to 40 mt covered by the rare black coral and more than 15 dive sites. This zone is a paradise for underwater photography. Marine life is abundant. 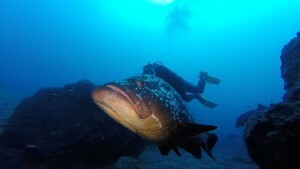 Divers may find there tunas, mackerels, large groupers and barracudas. 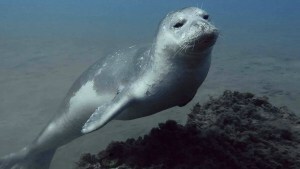 The average depth is 20 m.
Natural Reserve, primarily to protect the rarest species of monk seal: Monachus monachus, but is also known as an important seabird sanctuary. You can dive and relax in this small corner of paradise and it’s crystalline waters.